At the low end of the power spectrum are the nanopower conversion requirements of energy harvesting systems such as those commonly found in IoT equipment, which necessitate the use of power conversion ICs that deal in very low levels of power and current. These can be tens of microwatts and nanoamps of current, respectively. Tony Armstrong, Director of Product Marketing Power Products, Linear Technology Corporation explains. State of the art and off-the-shelf energy harvesting (EH) technologies, for example in vibration energy harvesting and indoor or wearable photovoltaic cells, yield power levels in the order of milliwatts under typical operating conditions. While such power levels may appear restrictive, the operation of harvesting elements, such as wireless sensor nodes (WSNs), over a number of years can mean that the technologies are broadly comparable to long life primary batteries, both in terms of energy provision and the cost per energy unit provided. Although primary batteries claim to be able to provide up to ten years of life, this greatly depends on both the level of power pulled out of it and the frequency with which it occurs. Systems incorporating EH capabilities will typically be capable of recharging after depletion, something that systems powered by primary batteries cannot do. Nevertheless, most implementations will use an ambient energy source as the primary power source, but will supplement it with a primary battery that can be switched in if the ambient energy source goes away or is disrupted. This can be thought of as a ‘battery life extender’ capability, giving the system a long working life - approaching that of the working life of the battery which is usually about 12 years for Lithium Thionyl Chloride chemistry. Of course, the energy provided by the energy harvesting source depends on how long the source is in operation. Therefore, the primary metric for comparison of scavenged sources is power density, not energy density. EH is generally subject to low, variable and unpredictable levels of available power, so a hybrid structure that interfaces to the harvester and a secondary power source is often used. The secondary source could be a re-chargeable battery or a storage capacitor. The harvester, because of its unlimited energy supply and deficiency in power, is the energy source of the system. The secondary power reservoir, either a battery or a capacitor, yields higher output power but stores less energy, supplying power when required but otherwise regularly receiving charge from the harvester. Thus, in situations when the ambient energy is not available for some reason, the secondary power reservoir can be used to power the down-stream electronic systems or WSN. The proliferation of wireless sensors supporting the IoT has increased the demand for small, compact and efficient power converters tailored to untethered lower power devices. One of the more recent emerging market segments covered under the IoT which is particularly interesting from an energy harvesting perspective is the wearable electronics category. Although still embryonic, this segment includes such products as the FitBit, Google Glass and the Apple Watch. Of course, wearable technology is not just for humans, there are many applications for animals, too. Recent examples range from ultrasound delivering treatment patches and electronic saddle optimisation for horses, to collars on other animals that track, identify, diagnose and so on. Regardless of the application, most of these devices require a battery as the main power source. However, for human-based applications, it looks like there will soon be wearable fabrics that can generate electricity from solar power sources. One can think of them as ‘power’ suits. One company at the forefront of such research is the EU funded project Dephotex, which has developed methods to make photovoltaic material light and flexible enough to be worn. Naturally, the material will convert photons into electrical energy, which can then be used to power various electronic devices worn by the user, or to charge their primary batteries, or even a combination of both of these. An obvious application for IoT is health monitoring, whether for hospital patients, or simply, health conscious individuals. Bio-stats are vital signs that measure the human body’s basic functions. These include body temperature, pulse/heart rate, respiratory rate and blood pressure. These are critical because an adverse change in vital(s) may indicate a decline in health and vice-versa. Hospitals and doctor’s offices are obviously well equipped with expensive devices to measure these bio-stats. However, imagine how much more quality of life could be improved if these bio-stats could be efficiently and inexpensively measured outside the medical arena. For example, in the home or at work, lifestyle and behaviour modifications could be made in real time, improving health and possibly extending or even saving lives. Another example might be the use of an exoskeleton to facilitate mobility for a paraplegic. Fortunately, a combination of device cost reductions and advanced sensor technology has improved to the point where the proliferation of medical and wellness smart wearables is increasing. These include simpler ‘single vital sign’ units that attach to the body, to more sophisticated full body sensor filled exoskeletons. However, from a power conversion IC standpoint, partitioning and efficiently powering these types of wearables is not trivial. Thus, it is clear that a wearable unit’s primary design goals would be to have a compact form factor, low weight for wearability and comfort, and possess ultra-low energy consumption to extend battery run-time/life. Linear Technology has introduced a number of power conversion ICs which have the necessary features and performance characteristics to enable such low levels of harvested power to be used in IoT devices. The LTC3107 is an integrated DC/DC converter designed to extend the life of a primary battery in low power wireless systems by harvesting and managing surplus energy from extremely low input voltage sources such as TEGs (Thermoelectric Generators) and thermopiles. With the LTC3107, a point-of-load energy harvester requires little space - just enough room for the LTC3107’s 3mm × 3mm DFN package and a few external components. By generating an output voltage that tracks that of the existing primary battery, the LTC3107 can be seamlessly adopted to bring the cost savings of free thermal energy harvesting to new and existing battery powered designs. Furthermore, the LTC3107, along with a small source of thermal energy, can extend battery life, in some cases up to the shelf life of the battery, thereby reducing the recurring maintenance costs associated with battery replacement. The LTC3107 was designed to augment the battery or even supply the load entirely, depending on the load conditions and harvested energy available. Another example is the LTC3331 (see Fig. 2 above) - a complete regulating energy harvesting solution that delivers up to 50mA of continuous output current to extend battery life when harvestable energy is available. It requires no supply current from the battery when providing regulated power to the load from harvested energy, and only 950nA operating when powered from the battery under no-load conditions. 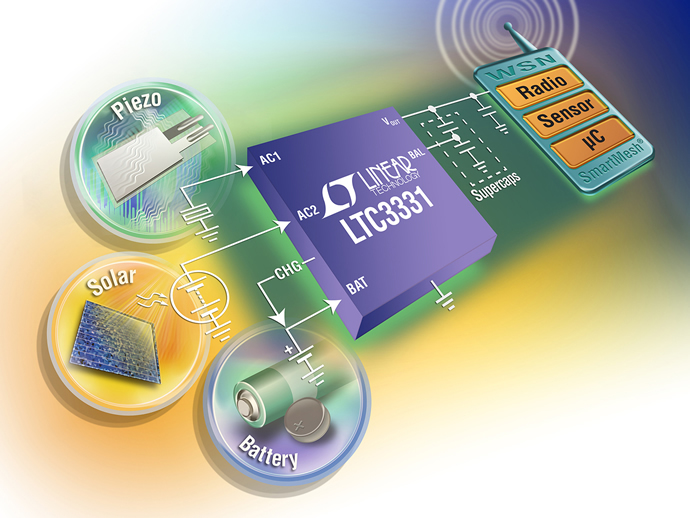 The LTC3331 integrates a high voltage energy harvesting power supply, plus a synchronous buck-boost DC/DC converter powered from a rechargeable primary cell battery to create a single non-interruptible output for energy harvesting applications such as wireless sensor nodes (WSNs) and IoT devices. The LTC3331’s energy harvesting power supply, consisting of a full wave bridge rectifier accommodating AC or DC inputs and a high efficiency synchronous buck converter, harvests energy from piezoelectric (AC), solar (DC) or magnetic (AC) sources. A 10mA shunt enables simple charging of the battery with harvested energy while a low battery disconnect function protects the battery from deep discharge. The rechargeable battery powers a synchronous buck-boost converter that operates from 1.8V to 5.5V at its input and is used when harvested energy is not available to regulate the output whether the input is above, below or equal to the output. The LTC3331 battery charger has a very important power management feature that cannot be overlooked when dealing with micropower sources. The LTC3331 incorporates logical control of the battery charger such that it will only charge the battery when the energy harvested supply has excess energy. Without this logical function the energy harvested source would get stuck at start-up at some non-optimal operating point and not be able to power the intended application through its start-up. The LTC3331 automatically transitions to the battery when the harvesting source is no longer available. This has the added benefit of allowing the battery operated WSN to extend its operating life from ten years to over 20 years if a suitable EH power source is available at least half of the time, and even longer if the EH source is more prevalent. Finally, the LTC3335 nanopower buck-boost DC/DC converter, with an integrated coulomb counter, is targeted at wireless sensor networks and general purpose energy harvesting applications. It is a high efficiency, low quiescent current (680nA) converter. Its integrated coulomb counter monitors accumulated battery discharge in long life battery powered applications. This counter stores the accumulated battery discharge in an internal register accessible via an I2C interface. The buck-boost converter can operate down to 1.8V on its input and provides eight pin selectable output voltages with up to 50mA of output current. To accommodate a wide range of battery types and sizes, the peak input current can be selected from as low as 5mA to as high as 250mA and the full scale coulomb counter has a programmable range of 32,768:1. The smart IoT wearables market has exploded in recent years and the core architecture for a smart wearable device essentially consists of a micro-controller, MEMS sensor(s), wireless connectivity, battery and support electronics. Similarly, the proliferation of EH in WSNs in applications for improved building energy efficiency and system health monitoring for industrial machines and bridges is a key driver for low power conversion solutions. Why is battery power key in creating the IoT?